My Amazon book wish list is so long that I’ve totally forgotten what books I put at the beginning of it, but sometime in the last 6 months I added Ruth Reichl’s My Kitchen Year and was sort of waiting and secretly hoping that the price might drop. $14.99 for the Kindle edition seemed an extravagance, but I wanted the hardback which came in at a whopping 21 bucks. I’m not suggesting that it’s not worth that, but a girl can hope. But then my sister-in-law started sending me texts and emails about the book and the recipes and I decided I just had to make the leap. My compromise was to spring for the Kindle edition and so that’s what I did. This didn’t start out to be a book review, but it seems to have taken that turn. I will be brief and quickly say that I was just a little disappointed in the book overall, but it was a pretty good read mostly, and many of the recipes were so great. Like this one. If you’re like me, you’ve always thought that making dumplings had to be a s*#t load of work because they just look complicated, you know? But I couldn’t wait to post these cuz they’re so not. Complicated, I mean. 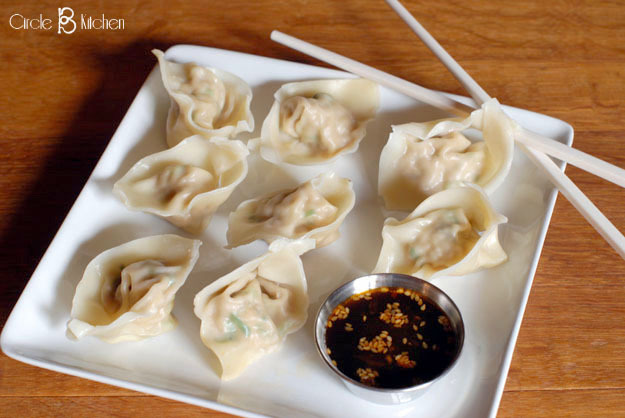 You’ll need some won ton wrappers. I found them in the produce section at Target. Mix your ground pork (I used turkey and it was awesome) with a little grated ginger, some scallions and the mushrooms, if you’re using them. Then mix together some sesame oil, soy sauce, rice wine or dry sherry and an egg white. Combine that with the ground meat and mix it up real well. Then you just put a teaspoon of that on one of the wrappers, moisten the edges with a little cornstarch and water, seal them up and then do that like 50 more times. OK, so you’re probably not going to do this when you get home from work, but you can do it whenever you have a little “free” time (what is that?!) because they freeze beautifully and whenever you need a dumpling or 20, you just pull them out and boil them for a few minutes and you’re done. They’re lovely with the dipping sauce of your choice; I’ve given you the recipe for my favorite. Chop the scallions (both white and green parts) and mix them with the ground pork. Add in the ginger and the shitake mushrooms. In another bowl mix the soy sauce with the rice wine (or dry sherry) and the sesame oil. Add the sugar, a good grind of black pepper, and the white of the egg. Stir this gently into the pork mixture until it’s completely incorporated, and allow it to rest for at least half an hour (or overnight in the refrigerator). When you’re ready to assemble your dumplings, mix the cornstarch into the water in a small bowl. Put a heaping teaspoon of filling onto the wonton wrapper, using your finger, moisten the edges with the cornstarch mixture, fold the wrapper over into a crescent (if using round wontons) and seal the edges, being sure to press out as much air as possible. If using square wonton wrappers, moisten the edges and then fold in half into a triangle and then bring to ends of the triangle together, press to seal and place on a baking sheet as it’s finished, making sure it’s not touching another dumpling. Cover with plastic wrap as you work. Freeze the dumplings, in a single layer, on their baking sheet. When they’re frozen, put them into plastic bags (they’ll keep in the freezer for 6 weeks). To cook, bring a big pot of water to a boil. Whisk together the soy sauce, vinegar, honey, garlic, ginger, sesame seeds, sesame oil in a bowl.